Maplewood, MN is a beautiful medium-sized town that has a ton of entertainment for the family. Whether you’re there for a visit to the Gateway State Trail or the Mississippi National River and Recreation Area or you’re just passing through the area, there is never a good time to let dental pain slow you down. Taking the time to search through directories can be daunting since you won’t be able to see the hours that the offices are open. When you visit emergencydentistsusa.com, you’ll have all the information that you need to make an informed decision about a new dentist. You’ll be able to search by city and see available dental offices in the area. You’ll be able to see their hours of operation, the types of payments that they accept, and some of the services that they provide. If you’re unable to get online, you can simply call our toll free dentist finder hotline. Our operators are available 24/7 to answer your calls. Once you choose an office, they can schedule your first appointment for you and even provide you with directions directly to your new dentist. When you’re going to your first appointment, you need to arrive about 15 minutes early. This will allow you plenty of time to complete the paperwork that new offices will have you fill out. You should also come prepared with a valid photo ID, a list of any medications that you are currently taking, and a copy of your insurance card. You should also be prepared to pay any copays that may be required. When you visit Maplewood, MN, you will have plenty of choices when it comes to dentist offices. Many of the offices will offer extended hours as well as Saturday hours to accommodate their patients. If you have a dental emergency, then you will likely be visiting a general dentist. 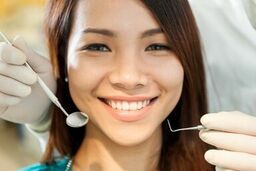 Many of these dentist are skilled in various areas of the dental field, but if they are not able to assist you, then they will be able to refer you to a specialist that can. Description: If you’re looking for a dentist office with extended hours as well as hours that are dedicated to emergency appointments, Community Dental Care is the right choice for you. The office has a goal to provide high quality dental care at an affordable price. They provide dental services for the whole family. Description: Maplewood Dental Associates provides state-of-the-art dental treatments to the entire family. From pediatrics to general dentistry, this office has you covered. Their goal is make sure each patient understands their treatment plan and feels welcome each trip to the office. Doctors: Mike Henrickson, D.D.S., Chu Cha, D.D.S. Description: Henrickson Dentistry offers same day appointments for patients that have an urgent dental problem. In addition to that, they also pride themselves on being a one stop dental solution that is able to handle all of your needs. Being in business for over 20 years, they provide patients with a family feeling that ensures they feel welcomed to each of their appointments. If you’re experiencing a dental emergency, it is important that you receive dental help immediately. If the pain lasts longer than an hour, it could be something serious. If you’ve experienced any type of trauma to your mouth, then you should go to the emergency room to be checked for broken bones or a possible concussion before you proceed to an emergency dentist. If the pain is onset without any type of accident, then it is possible that you have an infection that has reached the sensitive area of your tooth. Any time you are going to a dentist for the first time, it’s important that you verify they are properly licensed and have valid credentials. The easiest way to accomplish this is by searching for your dentist’s name on the Minnesota Dental Association website. You can also wait until your first appointment to ask the receptionist for this information. It is likely that this information will be displayed in frames throughout the office.